Balloon Fight Balloon Fight is a 1985 video game developed by Nintendo. The Arcade (Nintendo Vs. System), Vs. 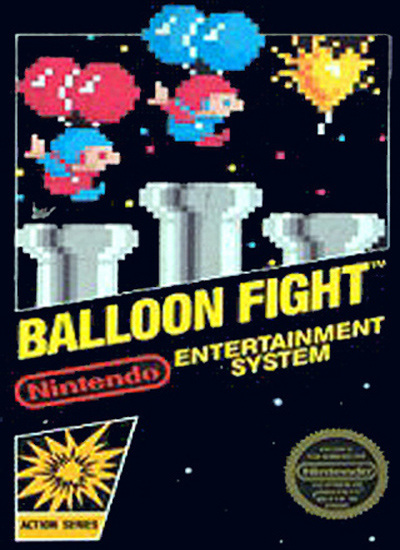 Balloon Fight, was originally released in 1984 and its Nintendo Entertainment System counterpart was Internationally released in 1986. The gameplay is similar to the arcade game Joust by Williams Electronics. The player controls the unnamed Balloon Fighter with two balloons attached to his back. Repeatedly pressing the A or B buttons causes the Balloon Fighter to flap his arms and rise into the air. If a balloon is popped, the player's flotation is decreased, making it harder to rise. A life is lost if both balloons are popped by enemy Balloon Fighters, if the player falls in the water, gets eaten by the large piranha near the surface of the water, or is hit by lightning. There are two modes of play: the 1-player/2-player game where the goal is to clear the screen of enemies, and Balloon Trip where the goal is to avoid obstacles in a side-scrolling stage. The original Arcade game does not include Balloon Trip, but all the level layouts are completely different to take advantage of vertical scrolling in addition to some minor gameplay differences. Defeat all of the enemies on screen to clear the stage. This mode can be played alone or co-operatively with a second player. Each player starts with three extra lives. Enemy Balloon Fighters float around the screen and the player must hit their balloons to defeat them. The enemy can also fall into the water or be eaten by the fish while flying close to the water's surface. If an enemy is defeated or falls into the water, a bubble will rise up the screen which can be hit for extra points. As play progresses through the stages, the number of enemies and platforms increases. Every three stages is a bonus stage, where the goal is to burst all of the balloons that float up the screen from the chimneys at the bottom. A single-player game where the goal is to avoid the lightning sparks and collect the balloons, aiming to move up the ranks and compete for the high score. The player starts with one life.